These days everyone, will almost everyone is concerned about their diet. One way to improve your diet is by pinpointing appropriate healthy substitutions to use in foods you love. One of the biggest misconceptions in our society’s diet is based upon the nutrition values of white flour. 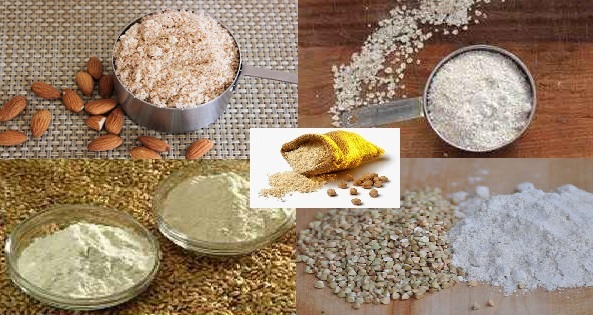 It is used in all types of recipes, breads, baking and gravies. White flour is high in carbs, has less nutrition than whole grain products, very fattening and harder for the body to digest. By using healthier flour choices you can avoid this unnecessary mess you are inadvertently creating for your body to handle. The following are a few substitutions to white flour you can consider next time you are baking or cooking! Whole wheat flour is a healthier choice than white and can be used as a substitute in baking and cooking. This is a great option for people following a gluten-free diet. Its density and ability to rise can make it a perfect substitute for most baked goods. It also has a fraction of carbohydrates as compared to white flour. Ideal for pancakes, muffins or cookies, this substitute could be what you have always been looking for in regards to a healthy alternative to white flour. The natural almond flavor helps to add sweetness to your recipe. This is something unique to almond flour and a great food to keep in your pantry. Furthermore, if used in large quantity the flour can act like a cake batter and create a light cake like consistency for you to work with. This type of flour is an exceptional food for use in baking breads. Barley is rich in fiber and zinc and can be mixed together with other flours. Barley is also ideal for thickening gravies and sweetening sauces. A little added trick is to lightly toast the flour before use to accentuate the hidden flavors that barley flour secretly has. Also, if used in the right way, it can add a little sweetness to your recipe as well. Keep in mind that barley flour is not gluten free, but still makes a great wheat flour substitute for baking. The following white flour substitutes are gluten free flours. Despite the name, buckwheat flour is gluten free and wheat free. This makes it a good option for whole wheat substitutes. The thing that you need to watch out for in this product is its dense qualities and strong flavor. This means it is great for use in products, such as, pancakes or pastas but you cannot use it as a thickener for a sauce because it will be too rich. Its earthy flavor can be good at times, but, can also overpower any good recipe, so try combining buckwheat with white flour in recipes. When it comes to gluten free substitutes, this is a common go to for vegans and those with Celiac disease. This flour is high in protein and calcium which allows you to balance out your diet. Its uses are abundant, including, for crepes, flat bread or hummus. This is probably your classic and most dependable option when it comes to healthy flour substitutes. Oat flour is all natural and helps to create a whole what product. Depending on which company processes it, this product can be gluten-free or low-gluten. It is optimal for use in cookie and other baked goods recipes. In summary, these are all great options for you to use as a substitute to white flour but it is important to remember that gluten-free doesn’t necessarily mean healthy. Unless you have Celiac disease, your body can naturally handle a bit of gluten on a regular basis, but, you should focus on the whole wheat and nutritional aspects of your diet if you are going to begin substituting for white flour. Remember, the key to being healthy is balance. This entry was posted in Reviews - Kitchen Utensils - Cooking - Food and tagged almond flour, Almond meal, Baking, Baking powder, Bob's Red Mill, Cake, Chickpea, chickpea flour, Chocolate chip, Coeliac disease, Flour, Gluten-free diet, healthy baking, Muffin, oat flour, Pancake, wheat flour, white flour, white flour substitutes, Whole grain, Whole-wheat flour. Bookmark the permalink. So glad you posted this. I use many different flours for cooking, baking and making breads. Delicious! I saw a recipe for pancakes using only bananas and eggs so I bet it is possible. We’ve gotten away from many things in our diet so this is great information. Thanks Jackie. Really it is the FDA that has steered us. But as many of us want answer to health problems, we are taking back the rains!! Thanks for your thoughts and for stopping by.